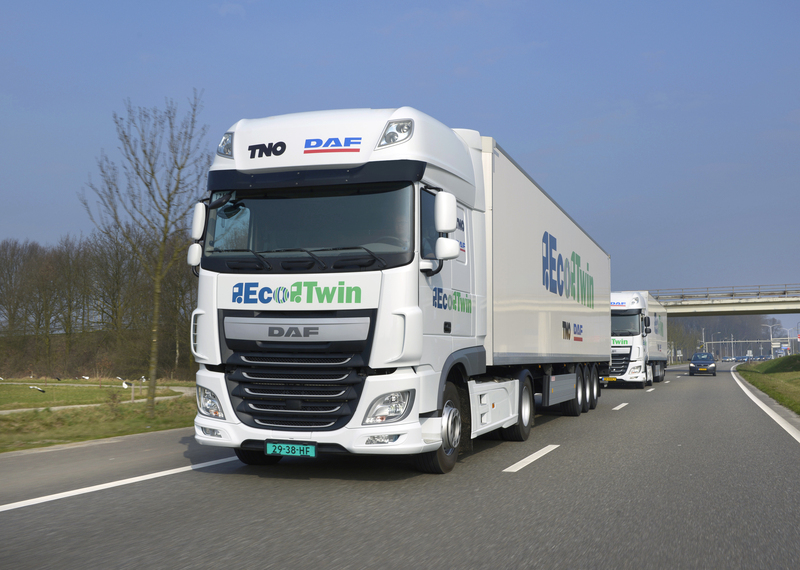 DAF and TNO demonstrate EcoTwin - DAF Trucks N.V.
During "Automotive Week", DAF and TNO demonstrated the "EcoTwin" project in front of the Dutch Minister of Infrastructure and the Environment, Schultz van Haegen and her Belgian colleague Galant. This demonstration on the N270 near Helmond showed two truck combinations – wirelessly linked via WiFi – driving a short distance from each other, with the driver in the second truck not being required to accelerate, brake and steer. This was a first in the Netherlands. 2-Truck platooning is the name for the concept where two trucks cooperate by driving a short distance from each other using automated driving technology. The intention of the EcoTwin experiment with TNO – the Netherlands Organisation for Applied Scientific Research – was to show that the second vehicle is technically able to follow a short distance from the front vehicle, using radar and camera information, thanks to wireless communication between the two vehicles. During this process, the second vehicle can automatically accelerate, brake and even steer. The objective of the project with TNO is to reduce the gap between the two truck combinations as far as possible, so that fuel savings of 10% can be achieved in the long term, along with equivalent reductions in CO2 emissions. "Just because we have showed that 'automated platooning' with two trucks is technically feasible, that doesn't mean that we are actually there yet", says Ron Borsboom, member of the Board of Management of DAF Trucks N.V. and responsible for product development. "We still need to do quite a lot of development work to ensure that the technology is completely reliable in any situation. Issues like legislation, liability and acceptance also have to be taken care of properly. Along with TNO, we expect that transport companies will be able to operate the first trucks using truck platooning safely on Dutch motorways and some major provincial roads by around 2020." The next step after last week's demonstration is testing EcoTwin in the Rotterdam harbour area. The Port of Rotterdam Authority and the Transport en Logistiek Nederland (TLN) trade organisation are involved in this process and the programme is supported by the Ministry of Infrastructure and the Environment. As a ground-breaking truck manufacturer, DAF is constantly exploring opportunities to further reinforce its leading position in the field of fuel efficiency and (thus) low CO2 emissions. 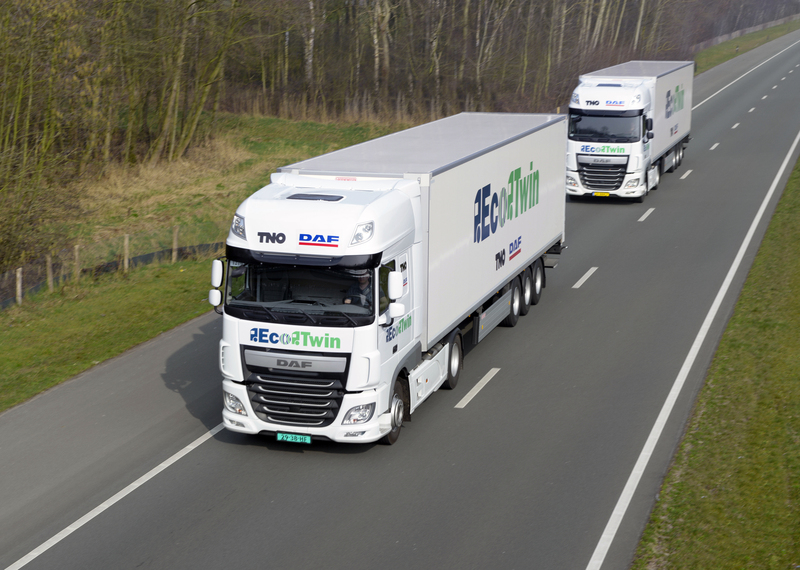 EcoTwin is among the promising technologies and also contributes to general transport efficiency, which is one of DAF's spearheads in truck development. DAF Trucks N.V. —a subsidiary of the American company PACCAR Inc, one of the world's largest manufacturers of heavy-duty trucks—is a leading manufacturer of light, medium and heavy-duty trucks. DAF manufactures a full range of tractors and trucks, offering the right vehicle for every transport application. DAF is also a leading provider of services: Multi Support repair and maintenance contracts, financial services from PACCAR Financial and a first-class parts delivery service by PACCAR Parts. In addition, DAF develops and manufactures components such as axles and engines for bus and coach manufacturers worldwide. DAF Trucks N.V. has production facilities in Eindhoven in the Netherlands, Westerlo in Belgium, Leyland in the United Kingdom and Ponta Grossa in Brazil, and over 1,000 dealers and service points in Europe and beyond.